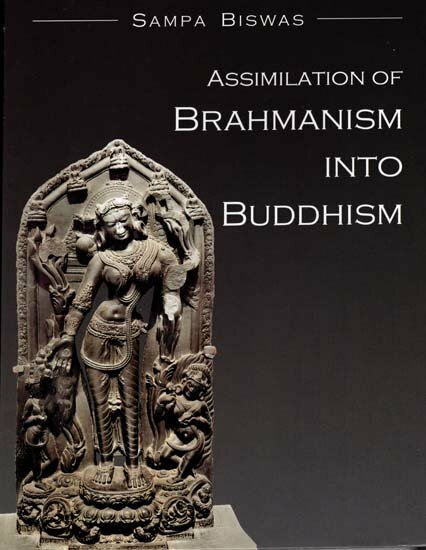 Assimilation of Brahmanism into Buddhism is a research work on Buddhism and Buddhist art of early medieval period in India. Archaeological materials and literary records suggest that Buddhism had a continuous existence during the third century BCE to the thirteenth century CE in India. Though early Buddhism was totally different in its doctrines and faith from the Brahmanical system, the Buddhism of today is a religio-philosophical system having assimilated and adopted new ideas and beliefs from the environment in which it was born and nurtured. The introduction of Tantrism bought Buddhism and Brahmanism closer to each other. It opened the gate to the vast field of Buddhist iconography along with Tantric practices, deities, mudras and mandalas. Many of these were influenced by the Brahmanic idea of godhead and some were the combination of one or more ideas of Brahmanic divinities. 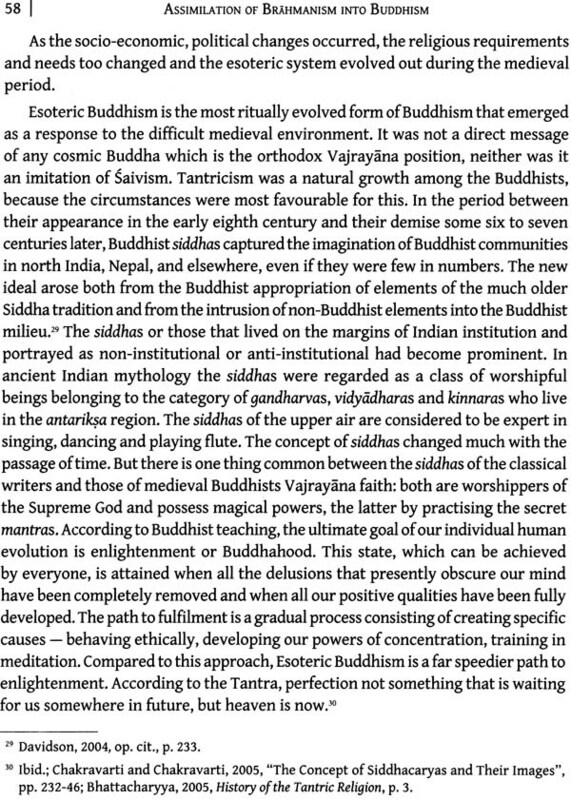 There was assimilation of a number of factors between Brahmanism and Buddhism. This scholarly volume addresses the different aspects of this assimilation process by getting into a historical study of Hinayana and Mahayana Buddhism; outlining the political history, and socio-economic and religious changes during 300-700 CE; scanning the political and economic background and the spreading of esoteric Buddhism; emergence of Vajrayana Buddhism; and providing a detailed sketch of Vajrayana images. Dr Sampa Biswas has done her PhD in art history from Kala Bhawan, Visva Bharati, Santiniketan. She is the author of scholarly papers and studies on Buddhist art of Central Asia, Japanese art, Indian art that have been published in reputed international journals. She is the author of Indian Influence on the Art of Japan (2010) and Fudo Mayo-a (Acalanatha Vidyaraja) in Art and Iconography of Japan (2012). She has been a visiting faculty member of Department of History of Art at the National Museum Institute, New Delhi and taught Buddhist Art of Central Asia, Art of Japan, Art of China, Art and Architecture of India, and also at the Department of Art and Aesthetics, Amity University, Noida. She has attended and participated in international conferences, seminars and symposiums. 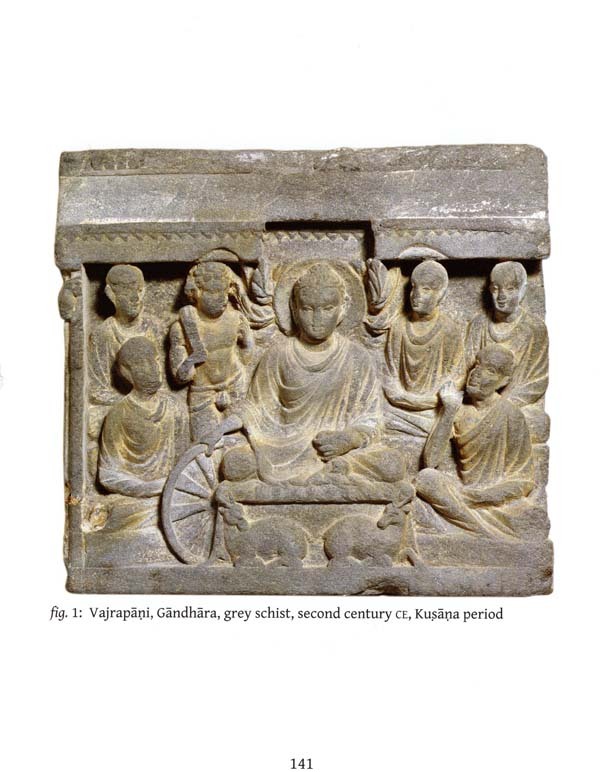 THE present book is a research on Buddhism and Buddhist art of early medieval period in India. From archaeological materials and literary records it appears that Buddhism had a continuous existence from third century onwards to the thirteenth century. Lord Buddha had preached a doctrine which was unheard of before and shown a path which makes an end of suffering leading to emancipation. 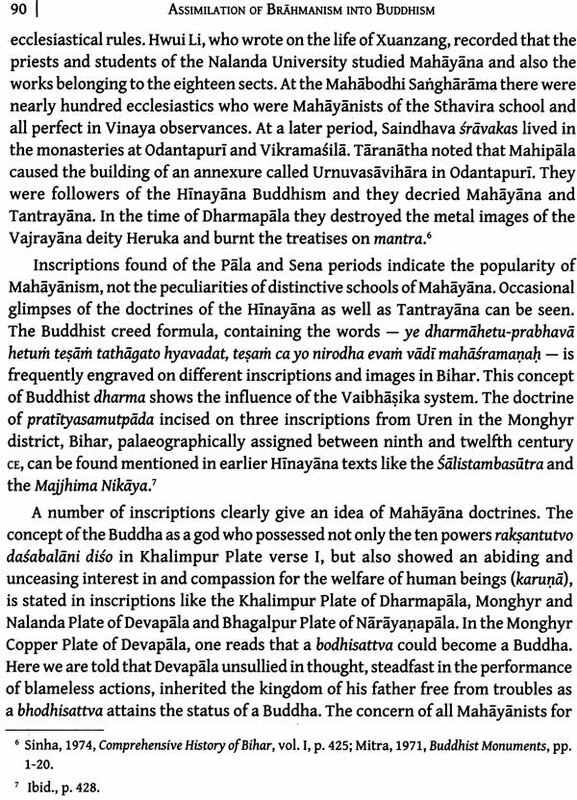 It was perhaps about a century after mahaparinirvana that Buddhism began to assimilate some current ideas and thoughts which ultimately led to the historical division of Buddhism into Hinayana and Mahayana. The concept of arhathood is negated in Mahayana and is substituted by that of bodhisattva hood. A bodhisattva may be a god, a householder, a recluse and even a non-human being. His function is to help man to achieve salvation. For this salvation there is no need to take up the difficult eightfold path; some good actions (paramitas) will do. Scholars differ as to whether the Buddha himself used the word Yana (vehicle), but in early Buddhism the three Yanas, such as the Sravakayana, the Pratyekabuddhayana and the Bodhisattvayana were recognized. The principal trend of early Buddhism was represented by the three schools, the Sthaviravada (Theravada in pali, the Sarvastivada and the Mahasanghika to which all the other schools owed their origin. The Theravadins upheld the arhat ideal, while the Sarvastivadins held that it was possible for a disciple (bhiksu) not only to aspire arhathood, but also to "pratyeka and samyak sambuddhahood". The Theravadins regarded the past existences of the Buddha merely as the account of the Buddha's bodhisattva career. 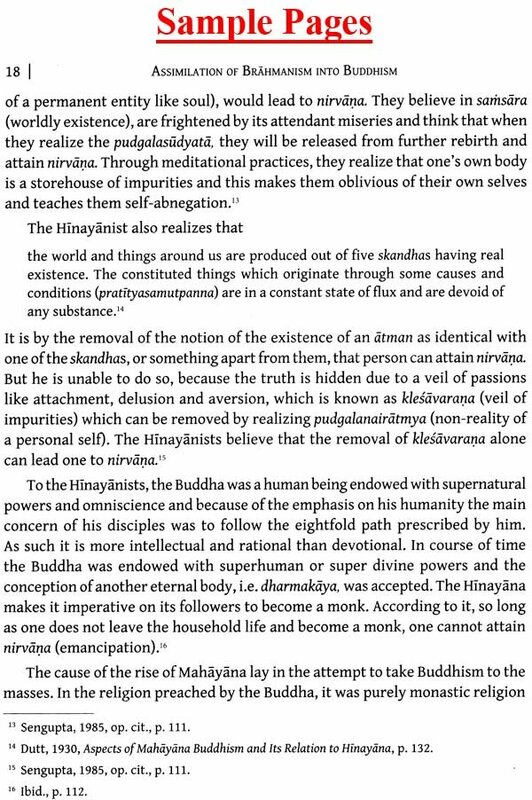 But the Sarvastivadins held the bodhisattva account not merely as the past lives of the Buddha, they regarded those past incarnations as also "depicting a universally valid spiritual ideal". The Mahayanists incorporated this doctrine and in their teachings, this principle of belief remained in the forefront. The Mahayanic ideal of the bodhisattva contended towards the universal enlightenment, or in other words, the bodhisattva ideal had for its goal the emancipation of all sentient beings. A bodhisattva is capable of attaining Supreme Enlightenment, but he forgoes such attainment, while he is to do so not for his own sake, but for the sake of an infinite number of sentient beings of all beings. The Mahayanists maintain that every follower of Buddhist religion "ought to aspire for Supreme Buddhahood". This ideal alone embraces the laity for leading them to the path of emancipation, and thus the ideal represents faculty of unbounded altruism, i.e. living and acting for the interest of others, and the bodhisattva ideal places the laymen in an honourable position and widens the scope for their participation in the religious activities. Once the portals of this monastic religion of rigorous moral discipline were thrown open, it paved the way for the infiltration of various practices, ideas and systems into Buddhism. 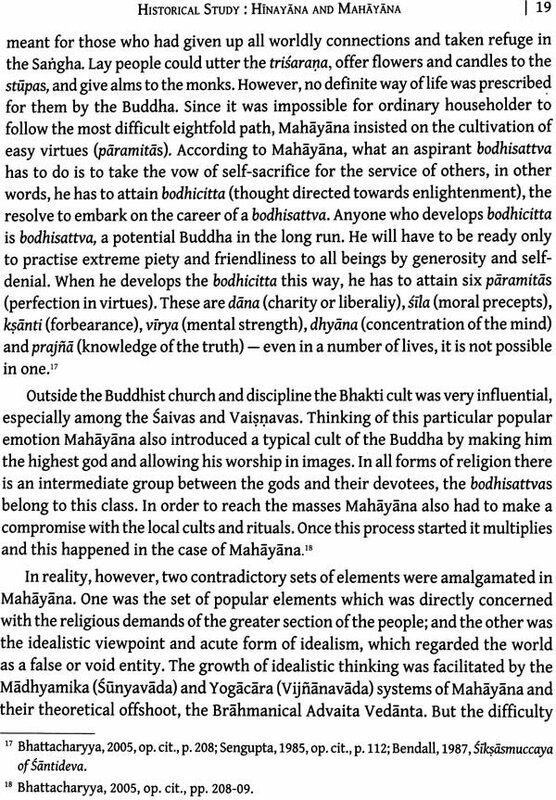 Mahayanism with its promise to deliver all beings and with the idea of making Buddhism acceptable to all classes of people began to adjust itself to the prevailing environment by incorporating various sorts of popular ceremonials and practices in the religion, and the ethico-religious nature of Buddhism started changing. The Indian subcontinent during the fifth to the twelfth centuries was a very different place from the India of the present day. Brahmanical Hinduism was still in process in establishing itself. The process involved the settlement of Hindu upper-caste families with land grants by Hinduizing rulers. The state was becoming increasingly Hindu but Buddhist institutions were still a conspicuous part of society. Hindu regimes continued to support the monastic universities, for example, in Bengal and Bihar. With the process of change continuing, in about the eighth century Buddhism underwent a great change when mantra, mudra, mandala and many other popular religious practices began to make their way into Buddhism. An altogether new form of Buddhism called Vajrayana appeared with much emphasis on rituals, meditational practices, gods and goddesses, etc. Various groups or sects began to grow within its fold with different interpretations of the cardinal principles of Buddhism. The new phase of Buddhism more or less a kind of Buddhist Tantrism and general appellation of Mantrayana or Tantrayana is given to all the sects taken together. 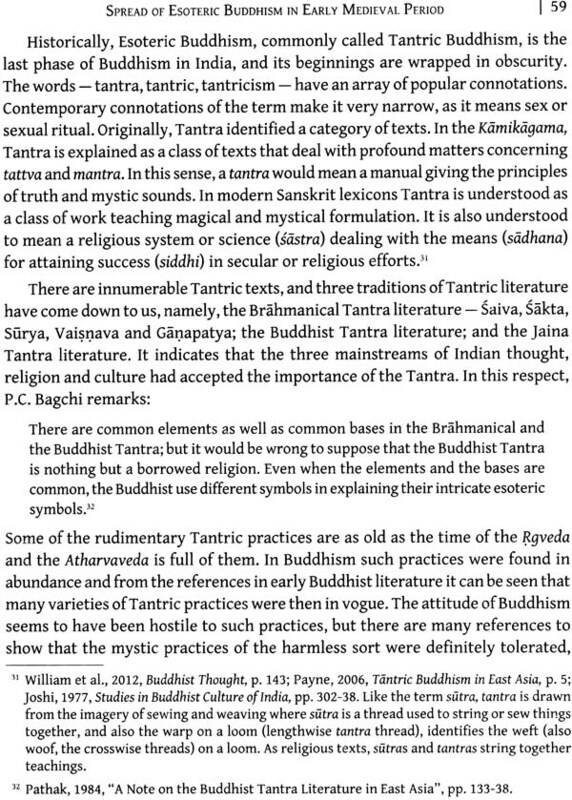 The elements on which the whole system of Tantrayana was based were not evolved by Buddhism out of its own materials but was the growth of the soil utilized both by the Hindus and the Buddhists. There is controversy about the priority of the community adopting Tantrism; both the sects, brahmanas and Buddhists, claim antiquity for their religion. But one thing is certain, the introduction of Tantrism brought Buddhism and Brahmanism closer to each other both in enmity as well as in similarity. Anyhow, Tantrism opened a gate to the vast field of Buddhist iconography. All the important texts and ideologies took the form of one or other divinity. Many of them were influenced by Brahmanic idea of godhead and some were combination of one or more ideas of Brahmanic divinities. 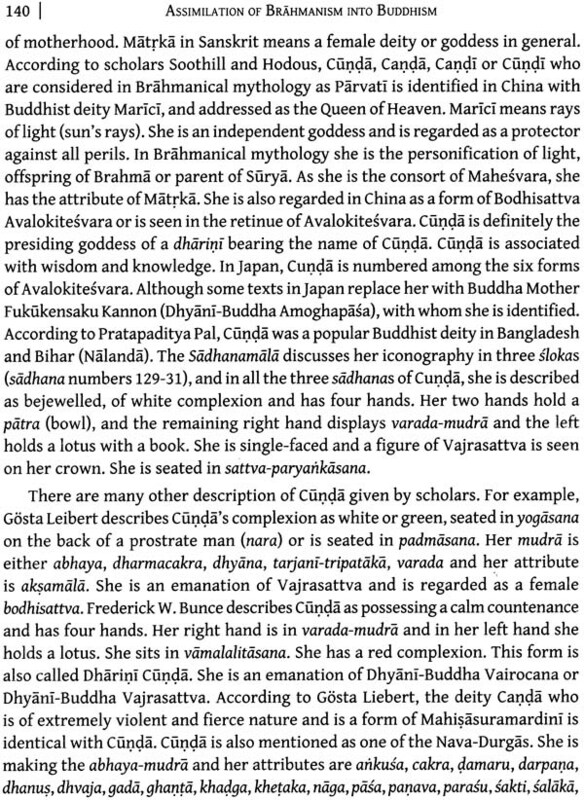 In reality magical practices were prevalent in Vedic India. As a natural consequence of the people's existing beliefs and faiths in those days, such magical practices and Tantric elements became a part of Buddhist life. 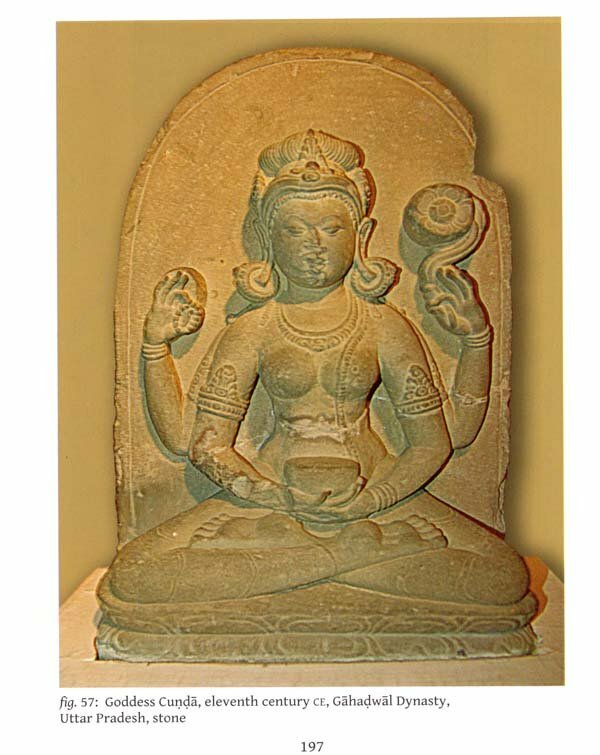 Much before the Tantra came to be regarded as an independent cult around the fifth or sixth century the pseudo- Tantrism, therefore, existed among some sections of the early followers of Buddhism. But a chronological account of the state of affairs in the few centuries preceding the Christian era is not known owing to the oral tradition of transmission of tantras or mantras from the preceptors to the disciples leaving no written records excepting a number of syllables which are called dharani or dharini. 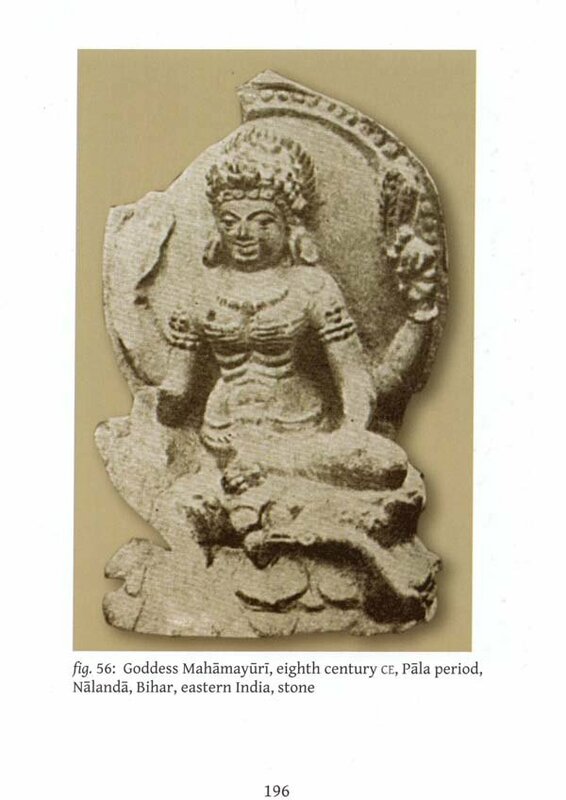 The Tantric practices, deities, mudras and mandalas are variously mentioned in one of the earliest Mahayana texts, the Manjusrimulakalpa, which was composed in the early part of the Christian era, probably around 200. But systematization of the Tantric practices, occurred for the first time in the Vajrayana work, the Guhyasamaja Tantra which is dated According to Santaraksita and his disciple Kamalasila, the Buddha gave instructions on Tantras, yoga, mudras and mandala for the benefit of less advanced followers who were more concerned with their material prosperity in this world than the spiritual advancement or nirvana. 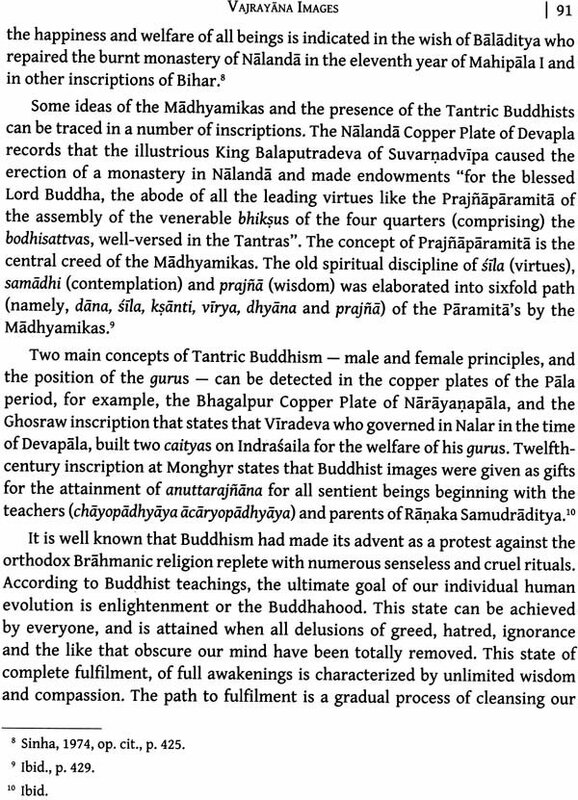 The Tattvasamgraha of Santaraksita, who is a later authority on Tantra (belonging to the eighth century), speaks about these instructions of the Buddha. DETAILED studies have been made in the past on the ideas and ideals that inspired India's religious art, therefore it becomes necessary to analyse the motivation that lay behind the emergence of the art. Stylistic studies in iconography have been made in large numbers, but to follow and understand the integration and differentiation that were constantly taking place in the various stages of its lengthy period of history impacted by stimulating impulses from within and without the country is certainly interesting. Social urge of the community, and social and political power balance have always been the main causes or the stimulating factors for the emergence of formal iconic art. It has always been the social and religious purpose of demand that resulted in the supply. The study of Indian art, therefore, involves aesthetic traditions, religious beliefs, sociological background and also the technical skills. By and large, these factors do not simply compel or impel the production of artistic creations, but the artistic creations are certainly conditioned by them. Certain slokas in the Rgveda would lead us to presume that there could have been some images of gods in use even in that age. It is unlikely that in the Vedic stages when performances of the sacrifices were paramount, the context of regular worship of any image could exist. Hinduism, during the last three centuries before Christ, was not so much coming into consciousness and prominence. In the centuries preceding the Christian era, when the fusion of races in India had already far advanced, the religion of India passed through its greatest crisis and underwent the most profound changes. Vedic rituals survived, but the religious outlook in India gradually changed and during the medieval and modern period, India had become profoundly different from that of the Vedic period. It is difficult to define religion as it existed in ancient India. Several limitations cloud our understanding. One such limitation is the assumption that it implies an universal god. At the other extreme is the belief that religion as a system for rituals centred around a faith. This outlook excludes not only emotional bearing, but also the use of images, cult objects as a rallying point. Notwithstanding the fact that there exists an equation between religion and images, yet it is different from worship. Religion is essentially a mental transcendent motivation, while image worship is by and large physical or temporal. Religion can be expressed by a mantra, while idol is defined by a tantra. Religion will have a mystique while image worship is garnished by cosmic myths and legends. Religion has an ethical base while icon worship has a ritual base. Religion can be sustained solely even by contemplation, but regular worship has a ritual base. The hallmark for religion is detachment while attachment is the guiding emotion of the other. Religion in the ultimate analysis is timeless, while the image worship is conditioned by time and space. The distinction is basic but not contradictory. For example, expressed in philosophic medium, intellect-based Advaita is a religion while Sakti-based Visistadvaita and Dvaita are essentially religious cults. But religion can never enthuse a community, hence an iconic dimension definitely accrues to it. In India, the basic assumption is that since ancient times, art found an expression mainly through religion. There is every likelihood that, even during Vedic period the knowledge of the Vedic gods like Mitra, Varuna, Indra, Visnu and Rudra did not and could not immediately result into iconic formulations. Even though the verbal pictures and the qualities of these divinities were known, the very first attempt image would have been very sedimentary. It would be feasible that even in the Indus Valley Civilization itself, there were only scattered ideas of what would be the appearance of some divinities, but a regular imagery had not emerged. But art, religious or any other, it is not just a matter of theme. Theme could well be only its content. It is the intent or the idiom employed for expressing the theme that is equally important, and for art historians this is to be taken as all-important. As a matter of fact Indian art history till the last decade of this century had mainly been following a pattern of analysing the thematic context of Indian art and much less the inner spirit and sensitivities. Indian art was looked upon as merely the illustrative material of Indian religion and philosophies, at any rate, of the ideas, myths and symbols that sustained them. Literary content, iconography and iconometry, therefore, became the most dominant note to dwell upon along with the religious and mystical implications of the objects represented. Second, art as an autonomous but not unrelated discipline or activity of man, in regard to the realm of sense perception, thought and understanding was not recognized. This is indeed a slightly uncharitable criticism. To some extent, it can also be said that rule by non-indigenous dynasties or powers had kindled a counteracting inner pride in one's own institutions and traditions were consciously defended. Third, the soul (atma) of art as presented in Indian literature on alamkaras failed to enter our consciousness. If, however, the question of form was ever brought in, it was in accordance with Western notions. Indian art had never been approached from the point of view of Indian life, or Indian understanding of the meaning and purpose of art, and it is only in recent years that we have awakened to a fuller knowledge of Indian views of art. Later writers on Indian literary aesthetics assert that the savour (rasa) of a piece of art is of the same origin as that of the joy of bliss (ananda). It is important to note that in Vajrayana and Sahajayana Buddhism as well as in medieval Vaisnava and Saiva ideologies, the sadhaka at the ultimate stage of realization is said to experience a kind of joy that one does in the consummation of the sexes. This seems to suggest that spiritual realization, however, subtle or esoteric or mystic, has a human habitation and is in no way transcendental or even idealistic in any supra-sensuous sense. The humanistic approach, rather than textual symbolism or mythological allusions and associations, should be able to explain the art of even the medieval period cult icons of India, as during this period, iconography, iconometry and scholastic priestly texts of esoteric nature ruled the field of institutional and hieratic religious and spiritual exercises. Though Indian art at any given time and space need not be understood simply in terms of esoteric, mystical or exclusively transcendental significance, it should not be mistakenly believed that Indian art was essentially naturalistic and project human experience. It should not be thought that spiritual realization is not suprasensuous and it has a human habitation. For this would substantially go against the well-argued truths of Upanisads, Dharmasastras and Epics. Indian religious art integrated several concepts into its matrix and secular sentiments do not vitiate much of its content, but only partially in its aesthetics. The present work is concerned with that phase of Buddhist art that goes under the topic of Vajrayana-Tantrayana Buddhism. The period under review, that is early medieval India, has been believed to be the time of decline of pure Hinayana and Mahayana Buddhism and the appearance of a new phase of religion in which the original ethical and philosophical principles were superimposed in such a way by an esoteric yogic system, combined with endless rituals and forms of worship, that could hardly be called Buddhism any longer. This research work is concerned with the Buddhist images when Vajrayana-Tantrayana Buddhism had evolved a fairly well-defined pantheon. The present research is concerned not only with iconographical features, but also with the motivating factors that led to the formulation of religious art of Buddhism during the early medieval period in India. This period is important as much as the earlier period just after the Christian era, as the development of Buddhist spirituality was influenced by the manifold and dramatic transformations in Indian culture and religion. A complete assessment requires us to consider the socio-political, religious matrices of the Indian environment, the military and political background of early medieval India, and their influence on the people, texts traditions that constituted the new ritually-oriented Buddhist system. This aspect of medieval India from the political, social, religious background has to be studied because a culture of belligerence is the result of many factors and becomes itself the agent of social, religious and cultural transformation, such that all facets of culture are subsequently influenced.